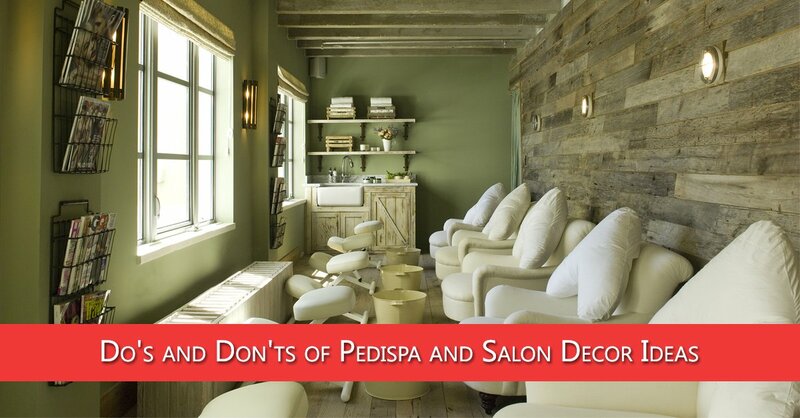 Before you start planning your salon décor, consider the space available to you carefully. Measure the floor area from wall to wall and plan where you will place the pedicure chairs and work tables. This will give you a general idea of where everything should be and help you create a shopping list. If you don’t take this step, you might go overboard and that would be a waste of money. Some nail salons look messy even if they’re cleaned well on a regular basis. This is mostly because of the design and décor of the place. If you have too many pieces of furniture and equipment, you’ll create a clutter that would make your salon look unprofessional. This would chase your prospective clients away. Less is more when it comes to salon décor. Bright and clean designs work well for a pedi spa. Most spas take the safe route and choose colors like white and grey in their décor. However, there’s no reason why you can’t experiment with bright and vivid colors. As long as the color isn’t neon and an eye-sore, your space will look fantastic. As a nail salon, you shouldn’t be afraid of color as it’s a part of your craft. Why not use interesting nail art designs like water-marbling on some of your walls? That would add to the environment and mood of your spa. Your nail spa should have smooth flow of movement in order to avoid accidents. It will be disastrous if your nail technicians trip and fall because of poorly placed pedicure chairs on their way their work stations. You should make sure that all furniture is out of the way and your clients and nails can move easily and freely through the salon. Most nail salons have a large number of equipment that needs to be stored safely. Some of your equipment can be displayed and will add to the décor while others should be tucked away in storage unit, out of sight. For example, you can display your nail polish colors on uniquely shaped wall shelves and display units. You can also conceal your less attractive pieces of nail equipment in smart storage options that blend in with the décor and don’t take up much space. Keep in mind that every inch of space is valuable in a spa, especially if you have a small store. It’s a good idea to invest a little more in versatile and space-saving storage options. Your nail salon should always be clean and well-maintained. Most salon owners don’t consider this when they decorate salon and install too many intricate pieces and decorative items in the premises. This makes cleaning a time-consuming and frustrating chore. Eventually, you and your technicians will stop cleaning as thoroughly as you should and that would cause problems. Dark salons don’t create the right environment and can be difficult to work in. You need great lighting to ensure your salon is always bright and visibility is good. Your technicians will also need task lighting to help them see what they’re doing. You can combine soft area lighting with task lighting to create a good working environment for your technicians and still set the right mood for relaxation. If you have any questions about salon furniture or want to know more about pedicure products, you’re free to contact us at Pedi Source. Just give us a call at 1855 429 PEDI. You can also email one of these two email address with your questions and contact details: [email protected] and [email protected].